The House of Representatives today broke into a rowdy session during an emergency sitting called discuss the removal of the controversial fuel subsidy. 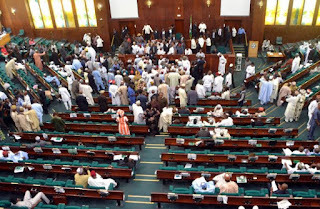 Trouble started when House Leader Femi Gbajabiamila moved a motion to invite the Minister of State for Petroleum, Dr. Ibe Kachikwu, to enter the chambers for members to engage him on last week’s increase in the pump price of fuel and the deregulation of the downstream of sector. 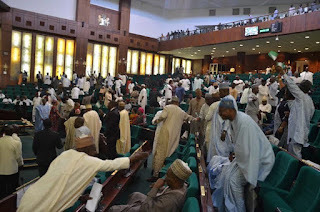 When the matter was put to vote by the Speaker, Yakubu Dogara, a majority of the members present voted in support of the motion, and the Speaker ruled in their favour. 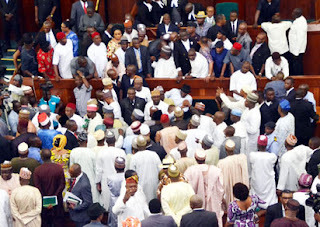 Angered by the alleged biased ruling of Mr. Dogara, who was accused to have ruled against the majority vote of those who had voted “Nay,” in the voice vote, the members of the Peoples Democratic Party (PDP) caucus stood up in protest, chanting a protest song and waving the national flag in their hands. The situation was brought under control when the Minority Leader, Leo Ogor, was asked to move a motion to go into a closed-door session.